I am sure you have heard of yogurt but have you heard about kefir? And if you have, do you know how to make kefir? 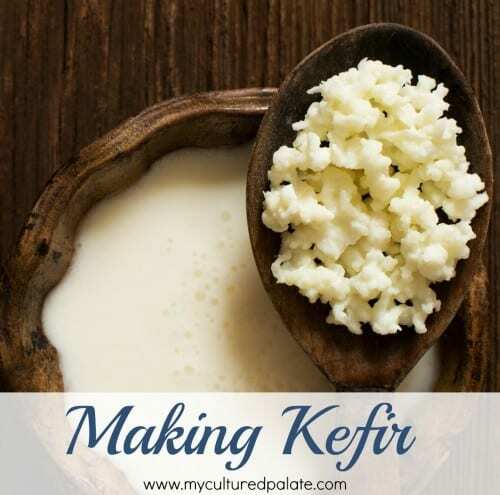 Before you learn how to make kefir, maybe you would like a little more info about it! 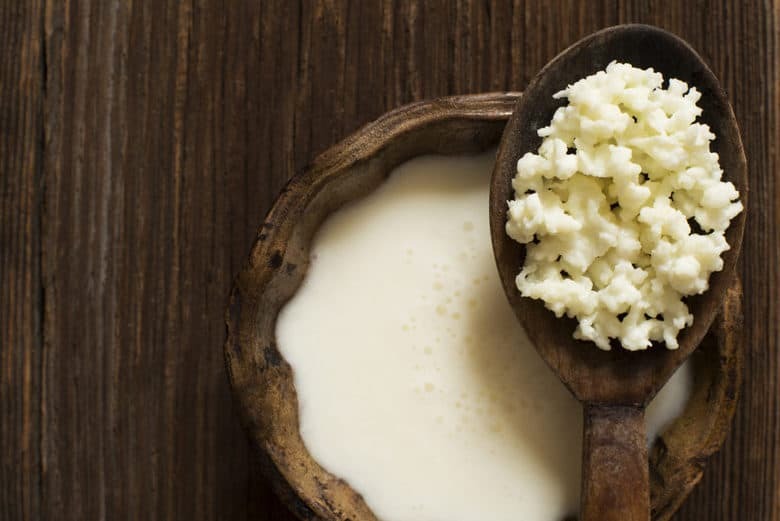 The nutritional powerhouse of kefir. Kefir products contain nutrients in varying amounts from negligible to significant, including dietary minerals, vitamins, essential amino acids, and conjugated linoleic acid, in amounts similar to unfermented cow, goat or sheep milk. At a pH of 4.2 – 4.6, Kefir is composed mainly of water and by-products of the fermentation process, including carbon dioxide and ethanol. Typical of milk, several dietary minerals are found in kefir, such as calcium, iron, phosphorus, magnesium, potassium, sodium, copper, molybdenum, manganese, and zinc in amounts that have not been standardized to a reputable nutrient database. Also similar to milk, kefir contains vitamins in variable amounts, including vitamin A, vitamin B1 (thiamine), vitamin B2 (riboflavin), vitamin B3 (niacin), vitamin B6 (pyridoxine), vitamin B9 (folic acid), vitamin B12 (cyanocobalamin), vitamin C, vitamin D, and vitamin E. Essential amino acids found in kefir include methionine, cysteine, tryptophan, phenylalanine, tyrosine, leucine, isoleucine, threonine, lysine, and valine, as for any milk product. Probiotic bacteria found in kefir products include Lactobacillus acidophilus, Bifidobacterium bifidum, Streptococcus thermophilus, Lactobacillus delbrueckii subsp. bulgaricus, Lactobacillus helveticus, Lactobacillus kefiranofaciens, Lactococcus lactis, and Leuconostoc species. Lactobacilli in kefir may exist in concentrations varying from approximately 1 million to 1 billion colony-forming units per milliliter and are the bacteria responsible for the synthesis of the polysaccharide kefiran. In addition to bacteria, kefir often contains strains of yeast that can metabolize lactose, such as Kluyveromyces marxianus, Kluyveromyces lactis and Saccharomyces fragilis, as well as strains of yeast that do not metabolize lactose, including Saccharomyces cerevisiae, Torulaspora delbrueckii, and Kazachstania unispora. The nutritional significance of these strains is unknown. Kefir has even more probiotic potential than yogurt – it is like yogurt on steroids! While yogurt normally has 5 – 7 strains of bacteria, kefir has 50+ strains of beneficial bacteria to nourish your body. Kefir grains, which look like little cauliflower pieces, are needed to make kefir. The grains are a mix of yeast and bacteria living in a symbiotic relationship. Since the grains multiply, it is very easy to obtain some from a friend who already makes kefir – if you have one. Otherwise, they are available online. Kefir is not as thick as yogurt. You can drink it plain but also makes a wonderful smoothie. While kefir alone has a twang to it, when blended with fruit and honey it is difficult to tell the difference between it and a smoothie made with yogurt. So, whether you have it plain or as a smoothie, it is a refreshing probiotic drink. How do I work with Kefir Grains? If properly cared for, your grains should last indefinitely. If you need a break from kefir making, the grains may be rinsed and refrigerated in non-chlorinated water (chlorine kills them). I have even read that freezing for future use is possible but have not tried it. Like most things, homemade kefir is tastier and more economical than its store-bought counterpart. With homemade kefir, you get the taste you prefer because the twang is determined by the length of time you leave the grains in the milk. Milk kefir grains may also be used to make coconut milk kefir. Follow the same procedure as shown in the video just be sure to revitalize the grains in dairy milk for 24 hours every few weeks to maintain their health. Watch the video yourself to see just how easy kefir is to make – below the video is a resource section of the things you see me use in the video and also the recipe. These are the links for the items you see me using in the video. I love seeing what others are using and why they like it. These links will take you to Amazon and other companies that I trust and personally use. Kefir Grains – The easiest way to get kefir grains is from a friend who is already making kefir. But, if you don’t have anyone you can order them and they come dehydrated with instructions to re-hydrate. I have used all the different brands of kefir grains on this page with success. Just make sure when you order that you get milk kefir grains. Strainer – This set of nylon mesh strainers is great, especially since it comes in different sizes. Berry Bowl Colander – This is the berry bowl colander that you see me using – it is amazing how many times I use it! Jars – I love these 1/2 gallon wide mouth jars and the plastic lids. In fact, I store so many different things in them they are all over my kitchen and pantry! If you do not need such large jars, the quart wide mouth work great and the same plastic lids fit them too. Polish Pottery Batter Bowl – I bought most of my Polish Pottery when we lived in Switzerland but have added to my collection here. The easiest way to find what you want is to check periodically for the pattern you are looking for. A few notes about milk types. This part of the Wikipedia article inspired me to learn more about traditional kefir. I hope it’ll do the same for you! Kefir grains will also ferment milk substitutes such as soy milk, rice milk, and coconut milk, as well as other sugary liquids including fruit juice, coconut water, beer wort and ginger beer. However, the kefir grains may cease growing if the medium used does not contain all the growth factors required by the bacteria. Milk sugar is not essential for the synthesis of the polysaccharide that makes up the grains (kefiran), and rice hydrolysate is a suitable alternative medium. Additionally, kefir grains will reproduce when fermenting soy milk, although they will change in appearance and size due to the differing proteins available to them. Kefir is like yogurt on steroids when it comes to probiotic count. It is also made without heating the milk which is a big plus when using raw milk. Put the kefir grains in a 1 qt mason jar. Pour whole milk over the grains leaving about 1 inch space at the top of the jar. Stir the milk and grains and cover loosely. Leave in a warm place for 12 - 24 hrs. - depending on the taste you prefer. The kefir grains culture the milk and the longer it is left the tangier it will become. I leave mine on the kitchen counter for 24 hours. If it has separated and there is a bit of liquid on the bottom, I shake it before straining. Pour the kefir through a strainer into another jar catching the grains in the strainer. How was your experience working with kefir? What made the process easier or harder? Share your experience in the comments! I have enjoyed “getting to know you” online. I watched the video above and it makes me wish we lived closer in real life. 🙂 We too have a family cow, Buttercup. I love your Polish pottery dishes as well. Thanks for all the good information you put out there. 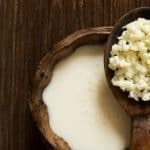 Is there a way to make kefir without milk? I have dairy issues. I really like your Polish Pottery. I was wondering if I could use some grains that I bought to make water Kefir to make the whole milk Kefir?